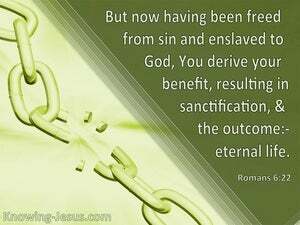 ﻿ Romans 6:22 But now having been freed from sin and enslaved to God, you derive your benefit, resulting in sanctification, and the outcome, eternal life. But now, since you have been liberated from sin and become enslaved to God, you have your fruit, which results in sanctification-and the end is eternal life! 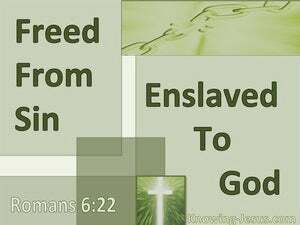 But now that you have been freed from sin and have become God's slaves, the benefit you reap is sanctification, and the result is eternal life. But now having been made free from sin, and having become servile to God, ye have your fruit for sanctification, and the end, eternal life. But now since you have been set free from sin and have become the slaves of God, you have your present reward in holiness and its end is eternal life. But now, since you have been freed from [the practice of] sin and have become slaves to God, the benefits you receive are a holy life [here] and never ending life in the future. But now, since you have been made free from sin, and have become servants to God, you have your fruit to holiness, and the end, eternal life. But now, being free from sin, and having been made servants to God, you have your fruit in that which is holy, and the end is eternal life. But now that you have been set free from sin and have become slaves of God, the return you get is holiness and its end, eternal life. but now being set free from sin, and actually in the service of God, the present advantage you reap is holiness, and the future everlasting life. But now, having got your freedom from sin, and having become bondmen to God, ye have your fruit unto holiness, and the end eternal life. But now having been made free from sin, and having become servants unto God, you have your fruit unto sanctification, and the end eternal life. But now that you have been freed from sin and have become slaves of God, the benefit you get is consecration, and the final result is eternal life. 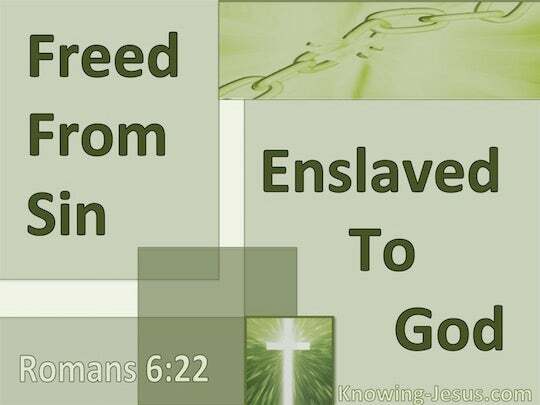 But now freed from sin and made slaves to God, ye have as your fruit sanctification and as the end, everlasting life. And now freed from sin, and subdued to God, ye have your fruit to consecration, and the end life eternal. 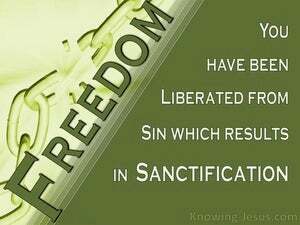 But now, having been set free from sin and having been enslaved to God, you have your fruit [leading] to sanctification, and its end [is] eternal life. But now, being made free from sin, and having become slaves to God, you have your fruit to holiness, and the end everlasting life. But now are ye delivered from sin, and made the servants of God, and have your fruit that ye should be sanctified; and the end: everlasting life. but now that you are set free from sin, now that you have passed into the service of God, your gain is consecration, and the end of that is life eternal. But now that you have been set free from sin and become slaves of God, the harvest-fruit which you are reaping tends to produce holiness, and it ends is life eternal. But now, freed from sin and enslaved to God, you have your benefit leading to sanctification, and the end is eternal life. But now, being made free from sin, and having become servants of God, you have your fruit of sanctification, and the result of eternal life. But now having been delivered from the slavery of sin, and having become the bondservants of God, ye have holiness as the fruit, and everlasting life as the end. But now having been made free from sin and made servants to God, you have your fruit in sanctification, and the end eternal life. Whereas, now, having been freed from sin, and made servants unto God, ye have your fruit for sanctification and, the end, life age-abiding. But now being set at liberty from sin, and become servants to God, ye have your fruit unto holiness, and at the end life eternal. But now that you have been set free from the control of Sin, and have become servants to God, the fruit that you reap is an ever-increasing holiness, and the end Immortal Life. But now being made free from sin, and having become servants to God, ye have your fruit to holiness, and the end everlasting life. But now that you have been set free from the tyranny of Sin, and have become the bondservants of God, you have your reward in being made holy, and you have the Life of the Ages as the final result. But now, since you have been freed from sin and have become the slaves of God, the immediate result is consecration, and the final destiny is eternal life. But now being set free from sin, and become servants to God, ye have your fruit unto holiness, and the end everlasting life. 21 Therefore what benefit were you then deriving from the things of which you are now ashamed? For the outcome of those things is death. 22 But now having been freed from sin and enslaved to God, you derive your benefit, resulting in sanctification, and the outcome, eternal life. 23 For the wages of sin is death, but the free gift of God is eternal life in Christ Jesus our Lord. "No weapon that is formed against you will prosper; And every tongue that accuses you in judgment you will condemn This is the heritage of the servants of the LORD, And their vindication is from Me," declares the LORD. "Then THE RIGHTEOUS WILL SHINE FORTH AS THE SUN in the kingdom of their Father He who has ears, let him hear. "These will go away into eternal punishment, but the righteous into eternal life." Not that I seek the gift itself, but I seek for the profit which increases to your account. Then one of the elders answered, saying to me, "These who are clothed in the white robes, who are they, and where have they come from?"